The Colony Theater's Cool Classics screening of Steven Spielberg's 1981 action epic RAIDERS OF THE LOST ARK, scheduled for tomorrow night here in Raleigh, reminded me that I once made a video recreating one of its most famous scenes. Yep, pretty sweet, huh? Take that, you kids that remade the whole damn movie back in 1989! 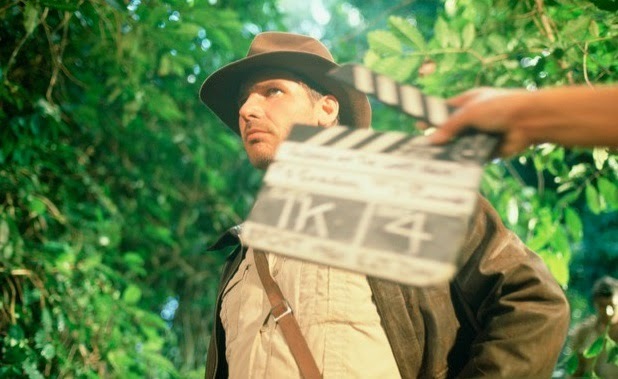 Indiana Jones and the Behind-the-Scenes Slideshow (Examiner, 5/20/14). Anyway, RAIDERS OF THE LOST ARK, Spielberg and George Lucas' immortal tribute to the action adventure serials of the '30s and '40s, screens as part of the Colony's Cool Classic series on Wednesday night, May 21st, at 7:30 pm. Admission is $5.00.